Toronto, ON – January 18, 2018 – Revival Gold Inc. (TSXV: RVG) (“Revival Gold” or, the “Company”), a growth-focused gold exploration and development company, announces results from the final eight holes of the twelve-hole 2017 portion of the Company’s planned 11,000-meter core drilling program at the past producing Beartrack Gold Project (“Beartrack”) located in Lemhi County, Idaho. 1 True width estimates are not yet known but are estimated to be approximately half of the drilled width. “All eight holes released today intersected significant gold mineralization”, said Hugh Agro, President & CEO. “Revival Gold will now initiate work on an updated resource estimate for Beartrack”. Seven of the eight drill holes released today (BT17-200D through BT17-206D) targeted near-surface oxide and mixed oxide-sulphide mineralization in the Ward’s Gulch and South Pit areas. These holes were targeted specifically to confirm historic drilling completed by Meridian Beartrack Co. (“Meridian Beartrack”) in preparation for an updated NI-43-101 Mineral Resource estimate at Beartrack this year. True width estimates are not yet known but are estimated to be approximately half of the drilled width. Recoveries for the intervals 124.5 m to 125.6 m, 126.0 m to 126.5 m and 131.1 m to 131.7 m were 25%, 19% and 17% respectively. Recovery for the intervals 135.9 m to 136.6 m and 136.9 m to 137.5 m was 0%. These intervals were included at 0 g/t Au. Recovery for the intervals 139.0 m to 139.6 m and 143.1 m and 143.7 m was 40%. Recovery for the interval 57.0 m to 62.5 m was 35.6%. Four intervals ranging in width from 0.1 m to 0.9 m were included at 0 g/t Au. Revival Gold’s near-surface drill results at both Ward’s Gulch and the South Pit compare favorably with historic drilling completed by Meridian Beartrack in the 1990’s. A more detailed comparison of 2017 drill results to historic results along with the preparation of an updated geological and resource model encompassing historic data as well as 13,737 meters of drilling completed in 2012, 2013 and 2017 is underway. In addition to near surface drill holes, Revival Gold completed two deep drill holes in 2017 (BT17-194DB and BT17-199D) targeting high grade mineralization previously intercepted at depth by BT12-175D at Ward’s Gulch. Neither of the deep holes drilled in 2017 replicated the high grades previously intersected by BT12-175D. Recovery for the interval 536.6 m to 536.9 m was 30%. 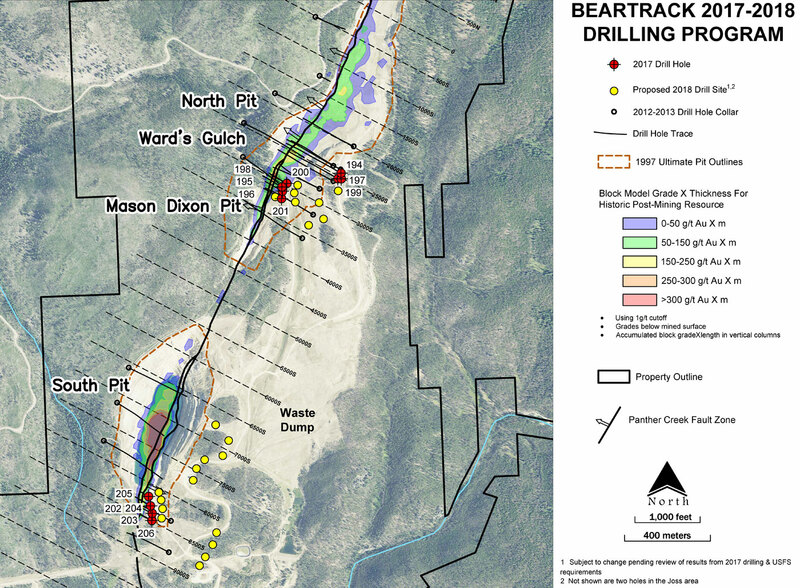 Gold mineralization at Beartrack occurs along five kilometers of the Panther Creek Fault and high grades have been encountered in a number of deep holes along strike. A reinterpretation of the geology integrating post-2012 drilling suggests that potential exists for additional high-grade along strike. With that in mind, in addition to surface drilling, further deep drilling will be planned to continue testing for high-grade mineralization in the Ward’s Gulch area and in four other known mineralized areas at depth along the Panther Creek Fault. Revival Gold’s technical team is currently finalizing details for the Company’s 2018 exploration program at Beartrack. The program is fully permitted and will include approximately 8,000 meters of core drilling. At the same time, the Company is planning drill hole locations for 2019 so that a Plan of Operations can be submitted to the United States Forest Service (“USFS”) in the spring of 2018 for permit approval in time for the 2019 drilling season. At Revival Gold’s neighbouring Arnett Creek Gold Project, a Plan of Operations has been submitted to the USFS. The Plan of Operations, when approved, will allow for the construction of up to 53 drill sites at Arnett Creek with approximately 2,000 meters of core drilling planned for late summer 2018. The map below describes the location of holes drilled at Beartrack in 2017 and location of holes currently planned for drilling at Beartrack in 2018. Quality Assurance/Quality Control consists of the regular insertion of duplicates, blanks and certified reference standards into the sample stream. Check samples will be submitted to a second laboratory once pulps have been returned to Revival from the primary laboratory. Sample results are analyzed immediately upon receipt and all discrepancies are investigated. Samples are submitted to the ALS Minerals sample preparation facility in Elko, Nevada. Gold analyses are performed at the ALS Minerals laboratory in Reno, Nevada and multi-element geochemical analyses are completed at the ALS Minerals laboratory in Vancouver, British Columbia. ALS Minerals is an ISO 17025:2005 accredited lab. Gold assays are determined by Fire Assay and AAS on a 30-gram nominal sample weight (Au-AA25). For shallow holes targeting oxide and mixed oxide-sulfide mineralization, gold is also determined by cyanide leach with an AAS finish on a nominal 30-gram sample weight (Au-AA13). Multi element geochemical analyses are completed on deep drill holes using the ME-MS 61 method. Steven T. Priesmeyer, B.Sc., M.Sc., C.P.G., Vice-President Exploration, Revival Gold Inc., is the Company’s designated Qualified Person for this news release within the meaning of National Instrument 43-101 Standards of Disclosure for Mineral Projects and has reviewed and approved its scientific and technical content. Revival Gold Inc. is a growth-focused gold exploration and development company. The Company has the right to acquire a 100% interest in Meridian Beartrack Co., owner of the former producing Beartrack Gold Project located in Lemhi County, Idaho. Revival also owns rights to a 100% interest in the neighbouring Arnett Creek Gold Project. In addition to its interests in Beartrack and Arnett Creek, the Company is pursuing other gold exploration and development opportunities and holds a 51% interest in the Diamond Mountain Phosphate Project located in Uintah County, Utah. Additional disclosure of the Company’s financial statements, technical reports, material change reports, news releases and other information can be obtained at www.revival-gold.com or on SEDAR at www.sedar.com. This News Release includes certain “forward-looking statements”. These statements are based on information currently available to the Company and the Company provides no assurance that actual results will meet management’s expectations. Forward- looking statements include estimates and statements that describe the Company’s future plans, objectives or goals, including words to the effect that the Company or management expects a stated condition or result to occur. Forward-looking statements may be identified by such terms as “believes”, “anticipates”, “expects”, “estimates”, “may”, “could”, “would”, “will”, or “plan”. Since forward-looking statements are based on assumptions and address future events and conditions, by their very nature they involve inherent risks and uncertainties. Actual results relating to, among other things, results of exploration, project development, reclamation and capital costs of the Company’s mineral properties, and the Company’s financial condition and prospects, could differ materially from those currently anticipated in such statements for many reasons such as: changes in general economic conditions and conditions in the financial markets; changes in demand and prices for minerals; litigation, legislative, environmental and other judicial, regulatory, political and competitive developments; technological and operational difficulties encountered in connection with the activities of the Company; and other matters discussed in this news release. This list is not exhaustive of the factors that may affect any of the Company’s forward-looking statements. These and other factors should be considered carefully and readers should not place undue reliance on the Company’s forward-looking statements. The Company does not undertake to update any forward-looking statement that may be made from time to time by the Company or on its behalf, except in accordance with applicable securities laws. This news release does not constitute an offer to sell or a solicitation of an offer to sell any of securities in the United States. The securities have not been and will not be registered under the United States Securities Act of 1933, as amended (the “U.S. Securities Act”) or any state securities laws and may not be offered or sold within the United States or to U.S. Persons unless registered under the U.S. Securities Act and applicable state securities laws or an exemption from such registration is available. MiningClips.com is committed to being your number one source for news on the latest trends, insight and perspective in the North American junior equities markets.